2015 May | whydocatholicsdothat.com Blog– Pray. God is waiting. whydocatholicsdothat.com Blog– Pray. God is waiting. The fundamental dogma, on which everything in Christianity is based, is that of the Blessed Trinity in whose name all Christians are baptized. 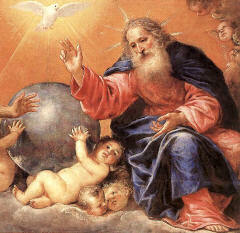 The feast of the Blessed Trinity needs to be understood and celebrated as a prolongation of the mysteries of Christ and as the solemn expression of our faith in this triune life of the Divine Persons, to which we have been given access by Baptism and by the Redemption won for us by Christ. Only in heaven shall we properly understand what it means, in union with Christ, to share as sons in the very life of God. The feast of the Blessed Trinity was introduced in the ninth century and was only inserted in the general calendar of the Church in the fourteenth century by Pope John XXII. But the cultus of the Trinity is, of course, to be found throughout the liturgy. Constantly the Church causes us to praise and adore the thrice-holy God who has so shown His mercy towards us and has given us to share in His life. Today is the feast of the Visitation which is superseded by the Sunday Liturgy. Click here for commentary on the readings in the Extraordinary Form of the Roman Rite. The dogma of faith which forms the object of the feast is this: There is one God and in this one God there are three Divine Persons; the Father is God, the Son is God, the Holy Spirit is God. Yet there are not three Gods, but one, eternal, incomprehensible God! The Father is not more God than the Son, neither is the Son more God than the Holy Spirit. The Father is the first Divine Person; the Son is the second Divine Person, begotten from the nature of the Father from eternity; the Holy Spirit is the third Divine Person, proceeding from the Father and the Son. No mortal can fully fathom this sublime truth. But I submit humbly and say: Lord, I believe, help my weak faith. Why is this feast celebrated at this particular time? It may be interpreted as a finale to all the preceding feasts. All three Persons contributed to and shared in the work of redemption. The Father sent His Son to earth, for “God so loved the world as to give His only-begotten Son.” The Father called us to the faith. The Son, our Savior Jesus Christ, became man and died for us. He redeemed us and made us children of God. He ever remains the liturgist par excellence to whom we are united in all sacred functions. After Christ’s ascension the Holy Spirit, however, became our Teacher, our Leader, our Guide, our Consoler. On solemn occasions a thanksgiving Te Deum rises spontaneously from Christian hearts. The feast of the Most Holy Trinity may well be regarded as the Church’s Te Deum of gratitude over all the blessings of the Christmas and Easter seasons; for this mystery is a synthesis of Christmas, Epiphany, Easter, Ascension and Pentecost. This feast, which falls on the first Sunday after Pentecost, should make us mindful that actually every Sunday is devoted to the honor of the Most Holy Trinity, that every Sunday is sanctified and consecrated to the triune God. 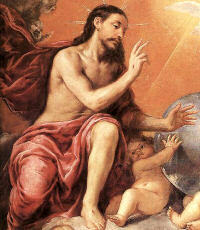 Sunday after Sunday we should recall in a spirit of gratitude the gifts which the Blessed Trinity is bestowing upon us. The Father created and predestined us; on the first day of the week He began the work of creation. The Son redeemed us; Sunday is the “Day of the Lord,” the day of His resurrection. The Holy Spirit sanctified us, made us His temple; on Sunday the Holy Spirit descended upon the infant Church. Sunday, therefore, is the day of the Most Holy Trinity. Symbols of the Trinity: Equilateral Triange; Circle of Eternity; Three interwoven Circles; Triangle in Circle; Circle within Triangle; Interwoven Circle and Triangle; Two Triangles interwoven in shape of Star of David; Two Triangles in shape of Star of David interwoven with Circle; Trefoil; Trefoil and Triangle; Trefoil with points; Triquetra; Triquetra and circle; Shield of the Holy Trinity; Three Fishes linked together in shape of a triangle; Cross and Triangle overlapping; Fleur de Lys; St. Patrick’s Shamrock. May 10 is Mother’s Day! 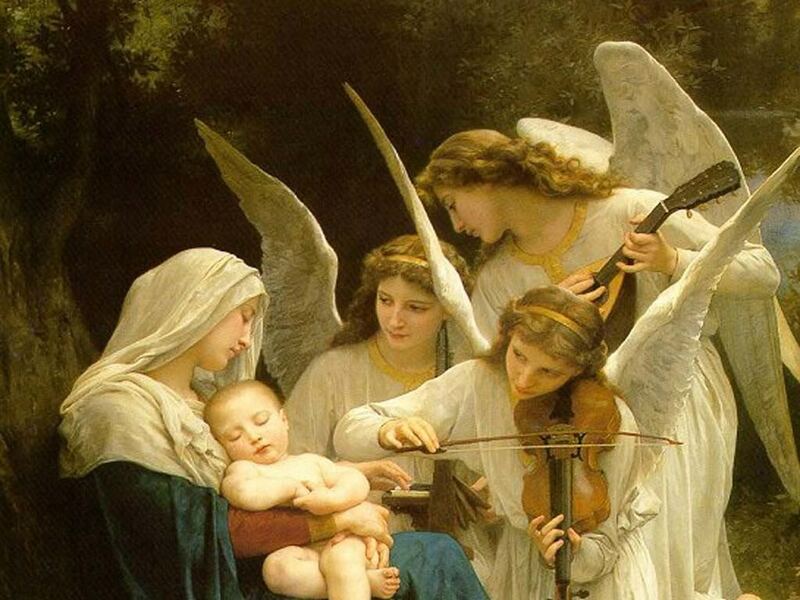 Beautiful portrait of our Holy Mother and baby Jesus with the Angels soothing the baby with celestial music. Most cultures around the world recognize central figures in their social order to give order to their world and credence to their customs and validate their existence. One such central figure is mom. Yes. That woman, who for most of us has either given birth to us, or has adopted us into their fold, that is woman who has been provided nurturing behaviors so that we can continue on our merry way so that we become independent beings with what little she may have made available to her; she is the one we celebrate. But there is one issue, however, I’d like to point to. Mother’s around this planet have been, for best or worse, that guiding arm in their child’s rearing–daily. That’s 24 hours a day, seven days a week, 365 days a year. Reading this blog may offer a hint of nudging you to go and appreciate her just by the sheer numbers of how long she has been your mother. But I offer you this: not just celebrate her this Sunday. I say every day is a Mother’s Day and every day she should be celebrated. Typically folks can relate the notion, despite that not all circumstances are ideal around the world, that we do have mothers amidst us that should not have been mothers to begin. But still, we offer them our prayers. Given this picture of mothers, we should still offer our moms out there some form of gratitude. Even if it’s a prayer or a thought. How about visiting her? That would make a great Mother’s Day. For those of us whose mothers may have passed away, those Mass Intentions work just as well, or perhaps even a visit to her grave to spend a few moments remembering her. So this Mother’s Day, don’t just make a call if you are long distance, offer her a Holy Mass with intentions for her. If she is in your vicinity, respect her and visit the woman who loves you. Notice I said ‘loves,’ and not ‘loved’ in the past tense. She loves you. Go and make her day. Because in the end, it would make your day and all days from that, a stepping stone to love and celebrate mom not just for a day. God bless you all this Mother’s Day and Happy Mother’s Day to all of you wonderful mothers out there. Copyright © 2011-2017 whydocatholicsdothat.com Blog– Pray. God is waiting.